Check valves are extremely simple devices yet they serve an important purpose in many pneumatic circuits. Generally used in systems where back flow is not permitted, check valves are two-port valves that allow free flow in one direction and block flow in the opposite direction. They can also be used as a bypass valve, allowing media around components such as needle valves which restrict flow in both directions. Pneumatic check valves rely on air flow to function and are designed with a specified cracking pressure, which is the minimum pressure required for the valve to operate. Because they are self-automated, pneumatic check valves do not require assistance to open or close and will continue to function without a manual operator, electricity or other external controls. Pneumatic check valves are commonly used in vacuum breakers, steam lines, cooling towers, HVAC system, sump pumps, pressure pumps, boilers and more. To meet the needs of your application, Pneumadyne manufactures a variety of Check Valves with threaded, barbed and push-to-connect ports. Our durable valves feature cracking pressures of 0.1 and 0.5 psi to quickly allow flow through the output port. ​Request a quote for pneumatic check valves today or contact us to request additional information. Barbed Input Port Check Valves: Electroless nickel plated brass available with multiple porting options. Operating pressure up to 125 psi and flow rates ranging from 2.5 to 9.5 scfm at 125 psi. 10-32 Input Port Check Valves: Brass check valves plated with electroless nickel for corrosion resistance and multiple porting options. Operating pressure of 0 to 125 psi and flow rates of 2.5 to 9.5 scfm psi depending on valve selected. 10-32 (F) Input Port Check Valves: Option of stainless steel construction or electroless nickel plated brass. Features compact inline or port mounting styles with an operating pressure of 0 to 125 psi and a flow rate of 9.5 scfm at 125 psi. 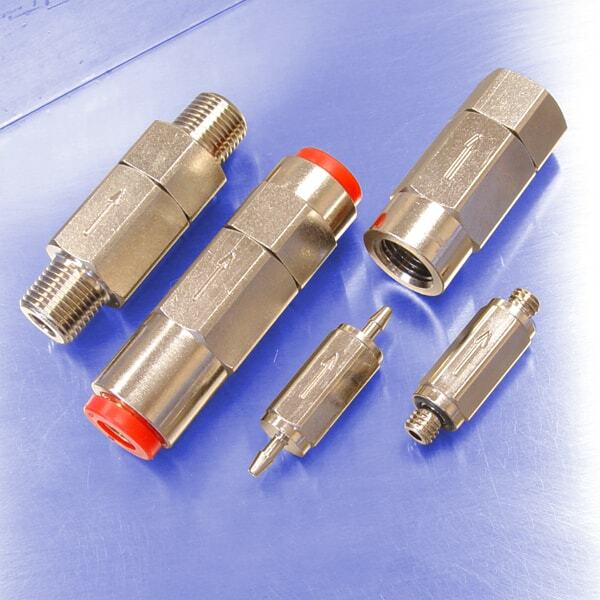 1/8 NPT (F) Input Port Check Valves: Offered in stainless steel or brass with an electroless nickel plated finish. Multiple porting options available with operating pressure up to 125 psi and flow rates ranging from 24.5 to 31.5 scfm at 125 psi. 1/8 NPT Input Port Check Valve: Manufactured from durable brass that is electroless nickel plated for corrosion resistance. Features a low cracking pressure, operating pressure up to 125 psi and flow rates ranging from 24.5 to 31.5 scfm at 125 psi. Pilot Operated Check Valves: Plated for corrosion resistance and features low cracking pressure to speed flow to the ports. Operating pressure up to 150 psi and flow rates ranging from 5.2 to 22 scfm at 100 psi. Pneumadyne is a manufacturer of standard miniature pneumatic valves including check valves, needle valves and more. We can also assist you with design and engineering of custom pneumatic components or full pneumatic control systems. Contact us today to discuss your pneumatic valve requirements.